Department of Homeland Security, FEMA, Washington D.C. In the event of a catastrophic incident or threat to the National Capital Region (NCR), the significant federal presence would both necessitate and complicate a robust response. 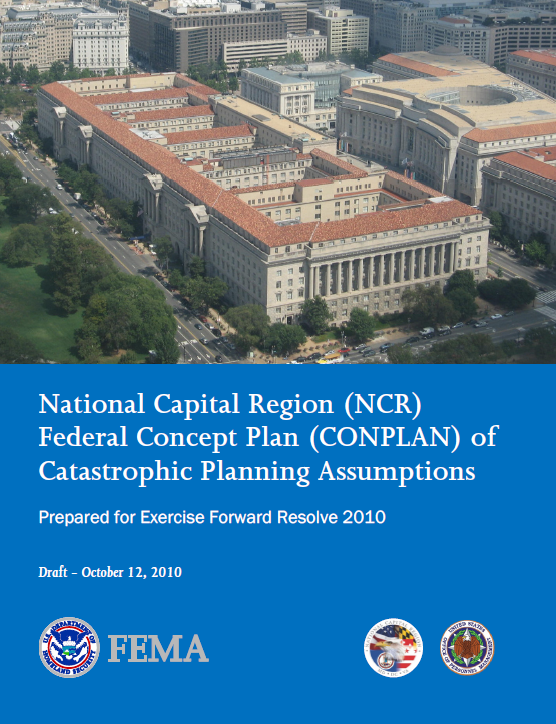 In order to facilitate the coordination that would be required for the integration of federal, state, and local response efforts, the Office of Personnel Management (OPM) and the FEMA Office of National Capital Region Coordination (NCRC) have compiled this draft NCR Federal Concept Plan (CONPLAN) of Catastrophic Planning Assumptions. For planning purposes, a catastrophic incident is defined in the National Response Framework as any natural or manmade incident, including terrorism, which results in an extraordinary level of mass casualties, damage, or disruption severely affecting the population, infrastructure, environment, economy, national morale, and/or government functions. As the chief law enforcement officer of the Senate, SAA is charged with maintaining safety and security in Senate areas of the U.S. Capitol and all Senate office buildings, as well as protection of the members themselves. SAA is responsible for immediate supervision of the Senate floor, chambers, and its galleries. SAA has the authorization to arrest and detain any person violating Senate rules. Decision‐making power resides with Senate leadership. In the event of the mass release of federal personnel or evacuation of the NCR, the Senate Sergeant at Arms (SAA) would work closely with the House and USCP to coordinate a response. SAA has scenario based processes in place to address specific threats. Typically, SAA and the Leadership Offices collaborate to come to a decision and present a course of action to Senate Leadership. SAA has the authority to work with USCP on protective details. SAA is a member of the Capitol Police Board. During National Special Security Events (NSSEs), representatives from SAA participate in various emergency coordination centers such as the Multi‐Agency Command Center (MACC), Transportation Security Operations Center (TSOC), etc. Key Federal Stakeholders: U.S. Capital Police (USCP); U.S. Park Police (USPP); U.S. House of Representatives Sergeant at Arms; Architect of the Capitol. In the event of a mass release of federal personnel or an evacuation of the NCR, the Security Protective Service would be responsible for coordinating protective actions for the CIA. In addition to their responsibilities as first responders, the Security Protective Service is also responsible for planning, preparedness, and coordination efforts in advance of any such response. The officers of the CIA Security Protective Service are a federal law enforcement officers and have law enforcement jurisdiction in the federal facilities under their protection. The Security Protective Service has established Memoranda of Understanding (MOUs) with the NCR jurisdiction of Fairfax County to control roads and direct traffic in the areas immediately surrounding the facilities under their jurisdiction. If there is an order to evacuate/release, the CIA Security Protective Service could station police officers at major intersections on and adjacent to the entrances and exits to CIA‐controlled facilities to control the flow of vehicular traffic, according to established MOUs. Coordination with local jurisdictions (e.g., VDOT and Fairfax County) would take place during all actions. The CIA Security Protective Service could send a representative to the local NCR jurisdiction’s EOC to coordinate actions requested by the agency. For example, the CIA Security Protective Service has a desk at the FFX EOC and have established relationships the FFX EOC personnel to facilitate more effective and timely coordination. The Security Protective Service could coordinate with the local and state jurisdictions to reset the timing of traffic lights to support increased traffic flow from their impacted facilities via established evacuation routes. The CIA Incident Management Team would depend on preexisting protocols established with the local NCR jurisdictions and partner federal agencies. In the event of any direct impact to CIA facilities and personnel, the initial response would be taken by the CIA Security Protective Service. The relevant local jurisdiction would support any secondary response, such as the Fairfax County or College Park Fire and Police Departments. The CIA Security Protective Service has an established relationship with the Fairfax County Office of Emergency Management (FFX OEM), and the two agencies regularly coordinate and participate in joint exercises. In the event of the mass release of federal personnel or an evacuation of the NCR, the Security Protective Service would coordinate with the local jurisdictions where CIA facilities are located through their emergency operations centers and with federal partners through established means of coordination. Examples include coordination with FFX OEM through the Fairfax Emergency Operations Center (FFX EOC) and the U.S. Park Police (USPP). Advising the President and department and agency heads on legal issues relating to government operations during the incident, and representing the Executive Branch when it is a party to legal proceedings. More generally, providing legal guidance and oversight in matters requiring a federal law enforcement response. Protecting and providing security for federal court personnel and designated Executive Branch officials. Where appropriate, initiating actions to investigate, prevent, disrupt, contain, and prosecute criminal acts presented by an incident. Overseeing federal law enforcement support to state and local governments in responding to civil disturbances, including oversight of the use of federal military personnel pursuant to the Insurrection Act, when invoked by the President. Conducting federal law enforcement activities and coordinate the federal law enforcement response as needed with state and local partners. Providing federal law enforcement assistance to state and local law enforcement organizations when requested to aid in the enforcement of state law. Approving requests submitted by state governors pursuant to the Emergency Federal Law Enforcement Assistance (EFLEA) provisions of the Justice Assistance Act of 1984, 10 U.S.C. §10501, for personnel and other federal law enforcement support. Coordinating ESF #13 (Public Safety and Security) functions of the National Response Framework through the Bureau of Alcohol, Tobacco, Firearms and Explosives (ATF). The Department of State, Bureau of Diplomatic Security (DS) is responsible for the protection of the Secretary of State, other high‐ranking State Department officials, and is the Lead Federal Agency (LFA) for protection of foreign dignitaries below the rank of head of state. DS also has protective coverage for the U.S. Ambassador to the United Nations, designated as a Cabinet‐level position. Responsibility for protection of all State Department facilities and staff. Shares authorities with the U.S. Secret Service – Uniformed Division for protective measures for foreign officials and embassies. In the event of the mass release of federal personnel or evacuation of the NCR, the State Department would work closely with the U.S. Secret Service (USSS), Federal Protective Service (FPS), and Metropolitan Police Department (MPD). There is close coordination with several nearby federal departments and agencies, including the Federal Reserve, Pan American Health Organization, U.S. Navy Bureau of Medicine and Surgery, and the Institute of Peace, as well as nearby buildings that house non‐governmental organizations (e.g., the American Red Cross and American Pharmacists Association). There is a process of notification from the Department of State to these stakeholders if an incident occurs. If State Department facilities need to be evacuated, the Department’s Bureau of Diplomatic Security and FPS would protect the perimeter of the facilities, and the Metropolitan Police Department (MPD) would protect the streets surrounding the facilities. The Department’s Bureau of Diplomatic Security has coordinated with some of the individual embassies within the District of Columbia; however, no overall coordinated effort for joint planning or exercising with foreign embassies is in place. Key Federal Stakeholders: U.S. Secret Service Uniformed Division; Federal Protective Service (FPS). Diplomatic Security uniformed officers (contractors) have Special Deputy U.S. Marshal (SDUSM) status when performing State Department protective missions – to include expanding the security perimeter and potentially closing streets in the vicinity of the main State Department complex. During an incident, the Department of 681 State may request that streets surrounding foreign embassies be closed off; however, they do not have the authority or assets to implement this and would rely on the USSS – Uniformed Division and MPD to implement this action. The Department has the authority to close off International Place; however, they do not have the assets to implement/enforce this and would rely on the USSS – Uniformed Division and MPD to implement this action. The Department coordinates the movement of visiting dignitaries to and from State Department facilities.